Over the weekend I had the opportunity to return to my hometown for a short visit with family and friends. It has been eight months since I moved to Muscatine, but it seems like years since I left the county seat (population 8,000) surrounded by farm land that I lived in for 55 years. The town does not sit on the banks of a river but it does have a medium size lake on which my dad taught me how to sail and how to fish and I taught my children the same and even taught them how to swim. Muscatine is about three times the size of Paris (Illinois, not France), sits on a world famous river, and has endless possibilities for young and old alike. Realistically the two communities have little in common. Beyond that surface reality, however, is a commonality shared by the people – rich, middle-class, and poor – a common vision to create a better lifestyle for current residents and for future residents. Downtown Paris is not the bustling center of activity that it once was, but most central business districts suffered from the mobility offered by the automobile and the convenience of malls. Nearly half of the buildings have been dismantled and hauled off to the landfill, leaving empty spaces of dirt and broken bricks or parking lots that hardly anyone uses. Some of these “lost” buildings had historical significance, others did not. Many could have been repurposed but the vision was not there. The fact that the downtown area is a mere shadow of itself was depressing to me as I drove through and remembered the store fronts, store owners, and merchandise offered during the days of my youth. Sadly, the march of time does not stop for anyone or anything. In my position with the City of Muscatine I can look back into the archives and see what Muscatine has accomplished particularly over the last 20 years. I can only try to imagine what my hometown would be like if the same principles of placemaking were used to create a comfortable, attractive, and secure environment. 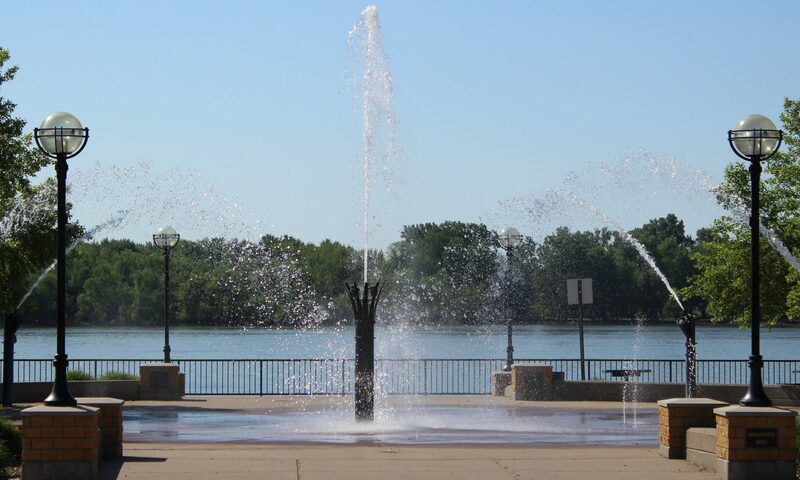 Muscatine does benefit from sitting on the banks of the mighty Mississippi River and by having a public park that few communities can boast of or call their ‘front porch”. Yet it is another value of this community that would have benefited my hometown the most … the combining of public and private investment in building restoration, housing development, and small business growth. This is what has ignited the revitalization of Muscatine’s downtown. Those efforts would work well in Paris. Creating and enhancing diverse use areas such as Riverside Park complimented with an avenue that will balance pedestrian and automotive traffic, and adding a downtown area strengthened visually and economically to be centers of social interaction is exactly the direction Muscatine is going. That is the direction my hometown needs to go too. I have always enjoyed nature (must be the Boy Scout in me) and empty spaces would be better served with a heaping helping of landscaping (grass, trees, plantings, walkways) rather than remaining a barren wasteland or a parking lot. Muscatine has seen the benefit of such a philosophy in increased property values and increased foot traffic to the small businesses in the downtown corridor. The public and private efforts, which now include the Mississippi Drive reconstruction and the development of a quiet zone through downtown, continue the placemaking principles that are advancing across the country. Many people have talked about saving the downtown in Paris. Even though there is a great awareness of this need, the vision and the support has not surfaced. Yes it took time to create that vision and develop the support structure here in Muscatine, but that just demonstrates the endless possibilities that are available to any community that has public and private entities willing to work for a better life for every citizen of that community. Whether you agree with the philosophy or not, you must agree that green space, pedestrian walkways, the customer service found only in small businesses, the availability of downtown apartments, and other amenities are benefiting Muscatine, not only the downtown area but throughout the community. The economy is doing well alongside the banks of the Mississippi. It is my hope that at some point when I have a chance to go home again I will see these same principles taking root in Paris. Nothing is ever as it was but something can be better than it is. Muscatine residents should be proud of their local government and the many private citizens from all walks of life who want to enrich this community and make it better for individuals and families, for the young to the old, for current residents and residents of the future, and for all visitors to this area.